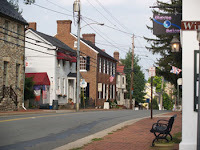 ﻿﻿ Leesburg was established in 1758 at the crossroads of the major north-south Carolina Road (now U.S. Highway 15) and the east-west oriented Potomac Ridge Road (now Virginia Highway 7) and is the seat of government for Loudoun County established in 1757. The town's rich history spans three centuries. The old downtown buildings reflect the early years in Leesburg’s history. Come visit and see this quaint town just 45 miles from Washington, DC and 14 miles from Dulles Airport.